Miniature Wicker Furniture and Wicker Baskets by Uncle Ciggie's Miniatures, Uncle Ciggie's Miniature Wicker Furniture and Wicker Baskets are meticulously handcrafted in One Inch, Half Inch, and Quarter Inch Scale for miniature collectors and dollhouse miniature enthusiast. Uncle Ciggie's Miniatures Wicker Dollhouse Miniature Furniture and Wicker Baskets are meticulously handcrafted in One Inch, Half Inch, and Quarter Inch Scale for miniature collectors and dollhouse miniature enthusiasts. Uncle Ciggie's Miniatures brings the feeling of comfort inside and outside of your dollhouse with wicker furnishings for every room. Let your imagination take its course with Uncle Ciggie's unique wicker designs. Uncle Ciggie's specialty is dollhouse miniature wicker furniture, wicker baskets, wicker plant stands, and dollhouse miniature lamps for your porch, gazebo, yard, patio or room box. Each of these wicker dollhouse pieces are meticulously handcrafted. Some pieces are Victorian reproductions, styled from different periods or created from ideas. In the workshop, ideas are designed, developed and adapted to scale. If you are looking for a wicker settee, chair, plant stand, desk, or a wicker basket, be assured that your piece will be made just for you! Special orders are always welcome, so if you should need the wicker color changed, want to use your special fabric you can do so, to match the room setting. Uncle Ciggie's Miniatures also makes standing ferns, hanging ferns and table ferns in one inch dollhouse miniature scale to accessorize Uncle Ciggie's wicker plant stands. 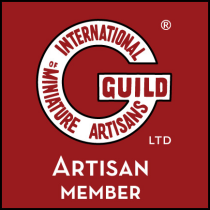 I will continually be expanding the line, so please check back often to Uncle Ciggie's Miniatures website for exciting new products, including a special section for half inch scale and quarter inch scale wicker furniture. Be sure to view updates on Uncle Ciggie's shows and workshop schedules. Thank you and enjoy your visit!